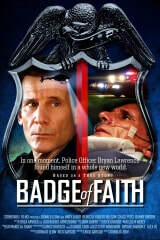 Badge Of Faith tells the true story of peace officer Bryan Lawrence. Kicked in the face and paralyzed neck-down, doctors say he will never walk again, but Bryan refuses to give up. I was the script supervisor and also voiced the Police Dispatcher off screen.